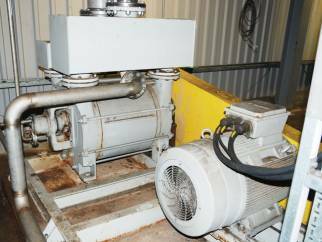 Siemens ELMO-F Type 2BE1 Closed Circuit Liquid Ring Vacuum Pump with vapour separators and motor. Type 2BE1253 OBY4-Z K26. Approx 2400m³/hr suction capacity at between 35 to 1013mbar suction pressure. #328345010001/2002. Motor Siemens Type 1LC6 253-4AA60-7 250M, 55kW, 50Hz and 1485rpm.